The FPL Draft game just isn’t doing it for me. Chalk it up to 37 years playing fantasy (NFL) football, but I find this version of the game boring. No other way to explain it. After 4 weeks I am 4th in my league on 145 points overall. For GW4 is was a score of just 30 points, which meant I didn’t lose my current ranking, but 5th place is creeping close, now just 6 points back. 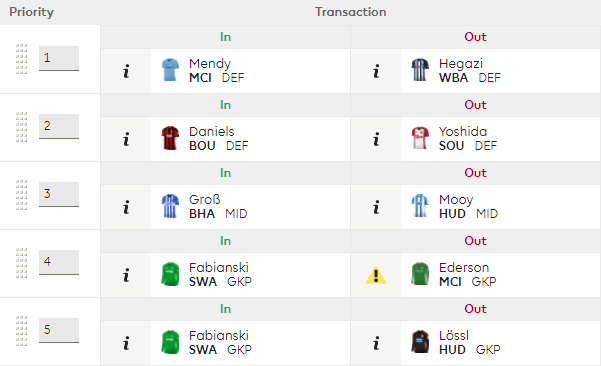 Prior to the start of the weekend games, I made two waiver moves in order to better my starting XI. In hindsight, the moves only accounted for 3 points. With Britos on a red card, I picked up Phil Jones. Unfortunately United couldn’t keep a CS and drew with Stoke City, 2-2. The other move was dropping Dusan Tadic in favor of Aaron Mooy, who didn’t return away to West Ham. Defensively I was led by “Dave” aka Azpilicueta, backed by his second assist scored 7 points to lead all defensive players. Hegazi, Jones and Lössl accounted for an additional 2 points. Needless to say, Hegazi is now on a short list to move out. Why I didn’t play Alderweireld against Everton, I am not quite sure. Still holding onto Coutinho, who should see his first EPL start in GW5. Midfield is where I am struggling, as it’s been a rotation of players through to find someone who may hit, based on fixtures. Jesé, Pedro and the aforementioned Mooy accounted for 6 points, with none of them returning. Alli gets a small bump as Spurs kept a clean sheet. Of the 5 midfielders, he is the one I expect to perform on a regular basis. Up front, it’s been a challenge with Agüero, Hernandez and Rooney. A pair of goals for the later two, but they haven’t done anything lately. Currently, I am on the verge of moving Rooney, but Everton does trail to Old Trafford, as Wayne faces his old team. Revenge factor? Hernandez hasn’t looked good, then again neither have the Hammers. But who in the free agency pool is better? Not much, but I’ve been considering a move. That leaves Kun Agüero to pull his weight, scoring 9 points on the back of a goal and assist. However those are his first points since GW1. It also appears Pep favors Jesus as well. I still expect good numbers from Kun the rest of the season, so he will remain a starter. For the week I have already submitted 5 waiver claims in order to strengthen my team and potentially take a shot at 3rd place this weekend. City is coming into form with some good fixtures. While I don’t expect much defensively from Pep’s boys, I will be looking for offensive returns from Mendy. Daniels would make his second appearance in my squad, as I had him from through GW3, opting for Britos that week. Mooy or Groß? Call this a knee jerk reaction to his 18 point haul in GW4. Brighton does have some favorable games. Ederson’s injury is a concern, but it will be Lössl making way (the graphic isn’t correct).